Cruise Embarkation, Baltra Island - During World War II, Baltra served as a U.S. military base protecting the Panama Canal from enemy attack. Now the cactus-strewn landscapes of Baltra are home to the region's main airport and where you will be greeted by Celebrity staff. After just a short bus and zodiac ride you will be aboard the ship. Your luggage will be delivered straight to your stateroom, giving you the opportunity to explore the ship and your home for the week. North Seymour Island - is a small island just north of Baltra. North Seymour is a small island just north of Baltra. It is home to the largest colony of frigate birds in the Galapagos. While keeping an eye out for male frigate birds trying to impress potential mates with an inflated red neck pouch, you may see blue-footed boobies dancing in a timeless courtship ritual. Sea lions and large land iguanas also roam about this rocky terrain. Excursion options: Walk, deep-water snorkel. Excursion options include a guided long, rocky walk, zodiac ride and short easy walk, or simply just a scenic zodiac tour along the coast to view wildlife and the geology of the area. Experienced snorkelers will also have an option to do a deep water snorkel at this site. This is a dry landing. South Plaza Island - One of two islands off Santa Cruz, South Plaza was born of upheaval, uplifted during a geologic event. The rocky island is strewn with prickly pear cactus and home to land iguanas, marine iguanas, and a colony of sea lions. Our excursion here is a short walk to view wildlife, flora, and geology. Santa Fe Island - Begin with a wet landing on the small beach in Barrington Bay. Large numbers of sea lions are found on the beaches and can often be seen surfing in the waves. Some of the island's endemic species include massive Santa Fe Opuntia cactus, the Galapagos Hawk, Galapagos Snake, rice rats, finches, and the Galapagos Mockingbird. Hike past saltbush where Galapagos hawks and Santa Fe land iguanas tend to roam. Keep an eye out for sea lions and the occasional sea turtles or ray. Excursion options: Walk, swim, kayak, Zodiac. Post Office Bay, Floreana Island - Rich in history, this site is home to the post office barrel established in about 1793, where pirates, buccaneers, whalers and others could leave their mail to be picked up by outbound ships. The tradition continues today, as visitors leave addressed postcards in the barrel and sort through left mail to deliver at home. Cormorant Point, Floreana Island - Floreana was the first capital of the Galapagos, and where Charles Darwin met the islands' Governor. Its small brackish lagoon is often home to flamingos, stilts, and white-cheeked pintail ducks, and one of its beaches is a highly used nesting site for sea turtles. Check out the green-hued sand where you land! Excursion options include a relatively short walk to the lagoon and sea turtle nesting beach, and optional snorkeling and swimming at the landing beach. Moreno Point, Isabela Island Along this beautiful rocky shore, a field of hardened black lava flows is pockmarked by shallow pools, which are home to shorebirds and flamingos. The mangrove-lined shore also provides a chance to see marine iguanas, sea turtles, stingrays, sharks, penguins, and the flightless cormorant. 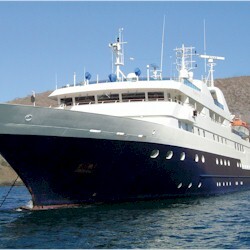 Excursion options include a long walk and zodiac ride, or an extended zodiac ride. This is a dry landing. Gardner Bay, Espanola Island - Located on the northeastern side of the island, Gardner Bay has a beautiful long white sandy beach perfect for relaxing and enjoying the beauty of the area. In the water, sea turtles, rays, colorful tropical fish, sea lions and maybe even a white-tip reef shark may be seen. If you happen to visit here between October and December, you will find Green Sea Turtles mating just off shore. Gardner Bay is home to some of the most inquisitive mockingbirds in the Galapagos. Excursion options: beach walking, swimming, or a deep-water snorkel for experienced snorkelers. Suarez Point, Espanola Island - Espanola is the oldest island in the Galapagos and home to an abundance of wildlife. At this site, visitors can expect to see sea lions, Galapagos Hawks, marine iguanas, and both blue-footed and Nazca boobies. Excursion options: long, rocky walk to look for Waved Albatrosses (March to January). They perform one of the most spectacular courtship rituals in the animal world. The second part of the walk is to observe an impressive blowhole that spews water like a towering geyser, which can reach 70 feet in the air. Optional shorter walk is also available. Day 10, Baltra to Quito - Upon debarking from your Galapagos cruise, you'll fly to Quito International Airport where you'll be transferred to the JW Marriott. Your luggage will be transferred from the ship directly to the hotel. Enjoy an optional afternoon excursion to the local craft market, time permitting. Dinner is served at the hotel. Day 11, Quito - - Enjoy a day in the Ecuadorean capital at your leisure. Breakfast is included. 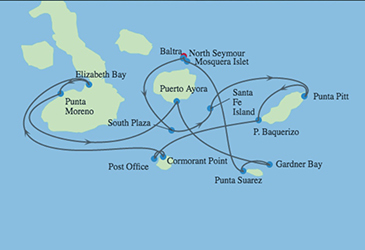 4 nights overnight hotel accommodation (2 pre/2 post cruise), Quito city tour, transfers, plus 7 night cruise round-trip from Isla Baltra and round-trip cruise from Isla Baltra and calling on North Seymour, Santa Cruz, Santa Fe, San Cristobal, Floreana, Isabela, and Espanola Islands.